Situated on the park like grounds of the five-diamond Ojai Valley Inn, the luxurious Spa Ojai stands alone as a retreat for both guests of the Inn and those escaping for the day. Two swimming pools, one a lap pool, flank the 31,000 square foot red tile roofed Spanish revival style spa. Twenty eight treatment rooms, resting rooms, mind and body programs, full service salon, complete fitness and separate men’s and women’s wet areas including saunas and whirlpools are housed on the premises. The Cafe Verde dining room and umbrella shaded patio serves exceptionally delicious, healthy indulgences including unique smoothies. Throughout, refreshing water, teas and fruit beg for the taking. The spa graciously extends an opportunity to get away from the distractions and annoyance of everyday life in this Freedom Zone — free from cell phones, pets, smoking and disquieting behavior. It’s a little slice of heaven. The Spa Ojai offers more than a dozen traditional and specialty massages including the “O” Water Therapy, the spa’s signature massage; the traditional Abhyanga Four-0Hand Massage, Detox Massage, and CranioSacral Therapy which corrects imbalances in the central nervous system. A variety of facials, body treatments, hand and foot luxuries and full salon services are all just a reservation away. Many repeat guest begin their spa program with the unique Kuyam, the only experience of this type offered in the United States. The Chumash word translates to “a place to rest together.” The treatment combines the therapeutic effects of three types of cleansing clay which each guest (up to eight men or women per session) applies to their bodies while relaxing in the steamy blue tiled Kuyam Room, a cool cloth applied to their foreheads. Piped in Chumash guided meditation and traditional Native American flute and drum music complete the relaxing experience. 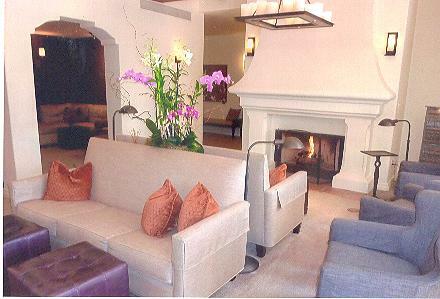 Elegant resting lounge at Spa Ojai. their first introduction to facial care and makeup by Spa Ojai specialists. Couples may enjoy a relaxing time together and every guest has the opportunity to create their own personal massage oil. Fitness walks, spinning, yoga, pilates and guided meditation classes are but a few of the options available at Spa Ojai. Guests escape into a pampering world of relaxation, activity, beauty, bonding or a bit of each in the magical setting of Ojai.